Abstract: This dissertation is a study of medieval theories of the nonsense word. I establish how Aristotle’s account of utterance underwent a major alteration in its transmission to the Middle Ages, such that the human voice came to be conceived of as in the first instance a non-signifying noise. I then examine the reception of this philosophical innovation in the logic, devotion, and poetry of fourteenth-century England. In chapters on Oxford logic, on the contemplative treatise the Cloud of Unknowing, and on Geoffrey Chaucer’s dream vision the House of Fame, I uncover the philosophical stakes of what I take to be a fourteenth-century preoccupation with nonsense. The first chapter establishes that the sixth-century Roman scholar Boethius introduced a new idea of vox, or utterance, as fundamentally nonsensical in his translations of and commentaries on Aristotle’s De interpretatione. The second chapter traces the inheritance of this idea in the Oxford logic of the twelfth through fourteenth centuries, and shows how although logicians attempted to banish nonsense words from their discipline, they were forced to confront them in the phenomenon of what they called material supposition, when a term stands for itself in a proposition. The third chapter proposes that the technique of prayer described in the Cloud of Unknowing consists in the production of a nonsense word through repetition, and that this technique–foreign to the mystical tradition in which the treatise is usually placed–is an elaboration of possibilities disclosed in the logical materials discussed in the dissertation’s first half. 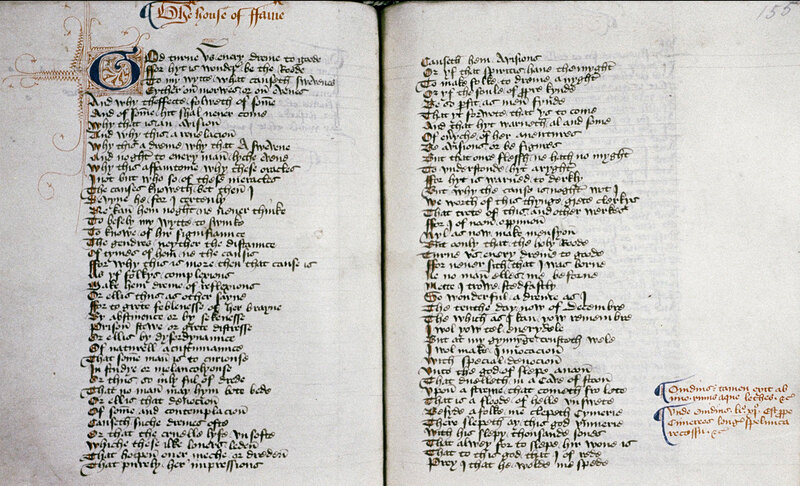 The fourth and final chapter, on the House of Fame, argues that Chaucer revises academic theories of vox into a theory of tydynges, or rumors, in which it is nonsense that allows for speech to emerge from a state of dumbness proper to the poet. The problem of nonsense that I recover in this project, although it is basic to Boethian logic and to medieval theory of language as a whole, has not been addressed by modern scholars. Neither was it given much direct attention in the Middle Ages themselves, persisting as a counter-tradition within a field that wanted very little to do with it. But in fourteenth-century England the problem was taken up with unusual intensity in the disparate fields that I consider here. In the Oxford logical materials, the line of transmission from Boethius is so direct as to be unmistakable: these logicians are working with terms and concepts that originate in his translations and commentaries. In the case of the Cloud of Unknowing and the House of Fame, the situation is different. These are not Latin but vernacular texts, a mystical treatise and an imaginative poem written outside of the discipline of logic and outside of the university more generally. I have focused on these two works—and not, say, any of the other vernacular works in which instances of nonsense appear—because they not only include nonsense words but also contain reflections on their nature and status. It is the wager of this project that the Cloud and the House of Fame contain elaborations of the Boethian nonsense word no less theoretical and no less sophisticated than those to be found in the logical treatises of their contemporaries at Oxford.